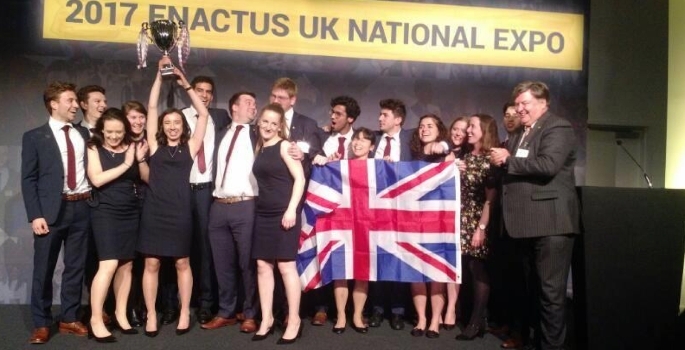 On the 10 and 11 April, the top 42 Enactus teams from across the UK competed in the Enactus UK 2017 National Expo at the ExCeL, London. The dynamic, energy-filled event brought together 750 university students, 60 academics, and over 350 senior UK business leaders across two days of celebration and collaboration of Youth Social Action and Social Enterprise. Key note speakers included Lord Victor Adebowale CBE. The Enactus teams competed for the title of 2017 Enactus UK National Champion by showcasing their social and community projects to business executives serving as judges. The students were evaluated on how successfully they applied business concepts and an entrepreneurial approach to improve the quality of life of those in need. The final round judging panel comprised 100 senior business leaders including Lord Michael Hastings of Scarisbrick, CBE, Global Head of Corporate Citizenship, KPMG International and Peter Holbrook, CEO of Social Enterprise UK. Enactus Southampton won the competition after showcasing two of their social enterprises. The first, Sole Support, trains vulnerable individuals within Kenyan communities to create shoes out of waste tyres and tackles three main issues: protection against infections and parasites, lack of affordable footwear and accumulating stock piles of waste tyres. The second, Juamaji, uses heat from the sun to purify dirty water whilst sustainably farming tilapia fish, providing both cleaner water and a staple food source to the communities they work in. Enactus Southampton will now go on to represent Enactus UK in the Enactus World Cup 2017, which will be held in London, at the same venue, ExCel from 26-28 September. This is the first time since 2001 that Enactus UK has hosted the Enactus World Cup, where 35 other Enactus country champions will compete for the global title. The two-day event consisted of more than just the competition and included an Enterprise and Employability Fair with over 35 corporate and social enterprise partners and a Project Exhibition in which the students showcased their flagship social and community projects to participants and judges. “Congratulations to the 2017 National Enactus Champion team from the University of Southampton and all of our 56 teams who delivered so much more social and community impact through their projects this year,” said Andrew Bacon OBE, CEO of Enactus UK.